Functional analysis is a powerful tool when applied to mathematical problems arising from physical situations. The present book provides, by careful selection of material, a collection of concepts and techniques essential for the modern practitioner. Emphasis is placed on the solution of equations (including nonlinear and partial differential equations). The assumed background is limited to elementary real variable theory and finite-dimensional vector spaces. Provides an ideal transition between introductory math courses and advanced graduate study in applied mathematics, the physical sciences, or engineering. 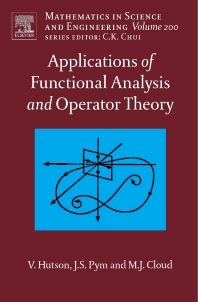 Gives the reader a keen understanding of applied functional analysis, building progressively from simple background material to the deepest and most significant results. Introduces each new topic with a clear, concise explanation. Includes numerous examples linking fundamental principles with applications. Solidifies the reader’s understanding with numerous end-of-chapter problems. · Provides an ideal transition between introductory math courses and advanced graduate study in applied mathematics, the physical sciences, or engineering. · Gives the reader a keen understanding of applied functional analysis, building progressively from simple background material to the deepest and most significant results. · Introduces each new topic with a clear, concise explanation. · Includes numerous examples linking fundamental principles with applications. · Solidifies the reader's understanding with numerous end-of-chapter problems. Graduate and prost-graduate students, researchers, teachers and professors.